The Bailey bridge was described by General Eisenhower as one of the three most important engineering and technological achievements of WWII, along with radar and the heavy bomber. Churchill was equally effusive and Montgomery wrote after the war. Bailey bridging made an immense contribution towards ending World War II. As far as my own operations were concerned, with the Eighth Army in Italy and with the 21 Army Group in Northwest Europe, I could never have maintained the speed and tempo of forward movement without large supplies of Bailey bridging. Without the Bailey Bridge, we should not have won the war. It was the best thing in that line that we ever had. There is no doubt that the Bailey bridge was a world beating design but it would be unfair to characterise it as the work of some lone genius. Sir Donald Bailey was inspirational, the driving force behind the design but he headed a team and many of the features that were found in the Bailey bridge were refinements or development of previous designs. The Bailey bridge design has endured and is likely to do so for many years. Although I have covered bridging operations that used the Bailey bridge in previous posts the image below provides a good example of just how many were constructed in North West Europe alone, Italy, Africa and the Far East also made extensive use of the Bailey. Donald Bailey was born in Rotherham on 18th September 1901. He was a pupil at Rotherham Grammar School until he went to The Leys School, Cambridge, at age 15. After Leys School he attended Sheffield University gaining a Bachelor of Engineering degree. His first job was with Rowntree in York, followed by work in the old L.M.S. Railway and then in Sheffield City Engineering Department. In 1928 he took a job as Civilian Engineer in the Experimental Bridging Establishment (EBE) in Christchurch on less than £400 per year. D C Bailey, pipe in mouth, sits in his office and examines the model of a Bailey bridge which is resting on his desk. Donald was the first Director of the successor to the EBE, the Military Engineering Experimental Establishment or MEXE, of MEXEFLOTE fame. In 1943 Bailey was awarded the O.B.E. and was knighted in 1946 for his valuable contribution to the Allied victory. The same year he also received an Honorary Degree of Doctor of Engineering (Sheffield University). 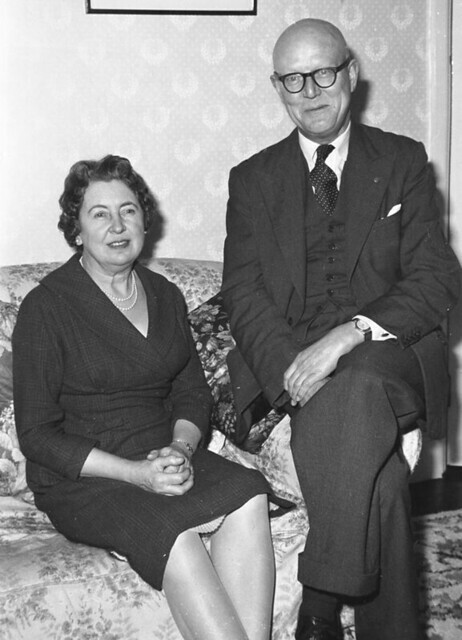 In 1947, he was made a Commander of the Order of Orange Nassau in recognition of the part Bailey bridges played in the reconstruction of Holland. Bailey retired from the Military Engineering Experimental Establishment (MEXE), Christchurch in 1962 and was appointed Dean of the Royal Military College of Science, Shrivenham. After four successful years in this post, he suffered his first stroke and retired. He returned to the Christchurch area in 1966 where he lived with his wife, Phyllis, until his death on 4 September 1985 in Bournemouth. No TD post on the subject would be complete without a British Pathe clip, click here to view. It all came down to weight and a tank named after a certain Mr Churchill. In the early stages of the war and just before it was realised that the existing British tanks were simply too poorly armoured. Subsequent design work resulted in the A22 Infantry Tank Mark IV, or Churchill. The first production models were produced in 1941 and weighed 39 tons. The need for a Class 40 bridge had been foreseen for some time and the Inglis Mark III (see the earlier post) was the first contender but even though it eventually came into service it was not really suitable. At a meeting in Christchurch in early 1941 the Structural Engineering Committee raised their concerns and decided that an alternative should be sought. That alternative was the Bailey Bridge, a design that Donald Bailey had been working on since late 1940 although it is reported that the EBE instructed him to do this on his own time and outside of the EBE offices! During the return journey from initial and problematical loading trails of the Inglis Mk III Donald Bailey produced his legendary envelope and sketched out a design concept that he had been thinking about for some time. Present were Major Stewart (Superintendent of the the Experimental Bridging Establishment) an Colonel Fowle MC of the Royal Engineer and Signal Board and the following day, further discussions and detailed design work commenced. After some calculations carried out by Captain Jarrett-Kerr, the now familiar K bracing configuration was chosen. One, flexibility was to be built in with the ability to create variable length spans, floating configurations and be able to be strengthened in situ if needed. Two, all parts were to be made from readily available materials and welded, certainly no aluminium alloys which were earmarked for Spitfires and the like! Three, all parts were to be able to be manufactured by standard engineering practices and companies which precluded extremely fine tolerances, although the tolerance and consistency must be sufficient to enable interoperability. Four, all parts were to fit in a standard 3 Tonne General Service lorry and be no more than 600 pounds in weight, or a six man lift. Five, launching and jacking down were paid particular attention and the design was to be simple to construct. Donald Bailey supervised the design effort although much of the detail work was carried out by Captain Charles Edward Jarrett-Kerr who would later be awarded the CBE for his contribution to the Bailey bridge and go on to be the last military director of the Military Engineering Experimental Establishment (MEXE). The expanded design team at the EBE also made a great contribution and interestingly, Mr Ralph Freeman Senior (designer of the Sydney Harbour Bridge) also contributed in his role of Chairman of the Structural Engineering Committee. Perhaps even more interestingly, Ralph Freeman Junior also served in the Royal Engineers posted to the EBE at Christchurch, ‘Junior’ would go on to build the Forth Road Bridge, Severn Bridgeand Humber Suspension Bridge. After a number of designs were considered the final 120 foot long double truss double storey prototype was built by Braithwaite and Co of West Bromwich (more on Braithwaite later) and readied for loading trials in by May 1941. This was an extraordinary feat, from an envelope sketch to full scale prototype in less than 6 months. Testing represented an interesting problem because the EBE had never had a test load of the weight needed. The solution was to utilise a WWI vintage Mark V tank and drive two lighter tank (Whippet Class 5) onto its roof using an early prototype of the Tank Bridge Number 1. The heavy tank was then filled with pig iron! Extensive tests, some to destruction, were carried out at the EBE and National Physics Laboratory using full size and one third sized models. From these tests a full set of loading, span and construction tables were generated and in parallel, training and development was also carried out to determine optimum methods of construction, maintenance and strip out. These were combined in a single user handbook. In total, there were 28 standard and over 100 specialist parts. A completed bridge had two main girders, left and right. These were made of multiple panels, pinned together, the same concept as the Heavy Box Girder Bridge I looked at in the previous post. These panels were arranged in one, two or three trusses and one, two or three storeys high. This is where terms like ‘double double’ come from. The first describes the number of trusses and the second, the number of storeys. A ‘double double’ Bailey bridge therefore has two trusses (panels) wide and two storeys high. Chord bolts were used to connect multiple panels in storeys and bracing frames and bolts were used when connecting multiple panels in horizontal trusses. 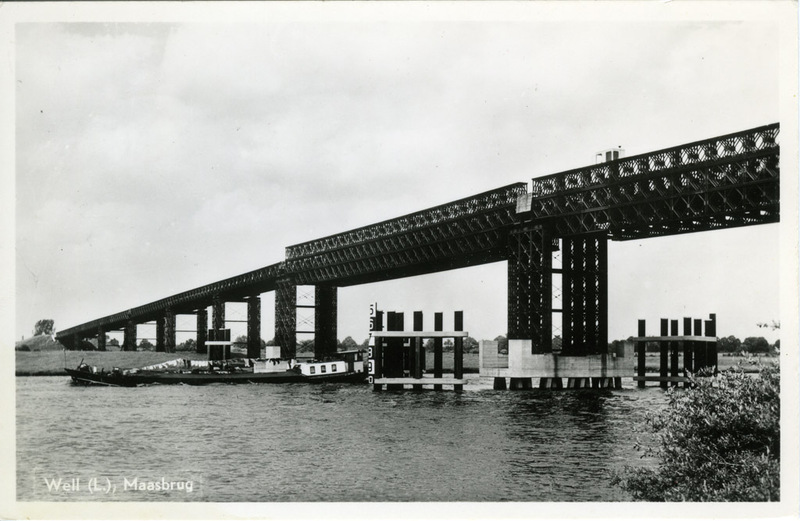 Two or four transoms could be fitted to each bay depending on the load to be carried and these connected the main panel longitudinal girders, secured using transom clips. The same transom could also be used as top bracing in the triple storey configuration. To provide extra stability and reduce twisting, sway bracing was connected in a diagonal configuration under the bridge deck to the corner of each panel. Stringers sat on the transom beams as a base for the timber decking or chesses and the ribands were bolted to the outer stringers to form a kerb. Specially strengthened ribands were used to create a ramp at the ends of the main bridge section. Footwalks could be attached to the overhanging transoms using footwalk bearers, this separated foot and vehicular traffic. Variations on panels, transoms and storeys would be used depending on the span and load carrying requirement. For example, a 90 foot long single-single at Class 9, 240 foot long triple-triple at Class 9 or a 150 foot long triple-triple at Class 70. Class 70 was the design load of a Churchill tank on its transporter. The first part of a bridge build is a recce and using the design tables found in the manual, the requirements for the build are determined. Although a post War bridge the video below provides an excellent example of how a single span Bailey is built. The Bailey bridge was designed for construction and launching by hand and this would be deemed to be the normal method. The panels and transoms were joined together on a roller, a launching nose attached to the front and the whole assembly pushed or boomed over the gap, locked and jacked down off the rollers and onto the base plate, the rollers being removed as part of the process. The decking and other elements were then completed. The launching nose was the lightest section of the bridge, consisting of the side panels but without the roadbed and angled upward to compensate for the inevitable dropping downward of the bridge as it expanded across the gap, this was particularly ingenious and vital when a crane on the far bank was not available. Despite the hand construction and launch norm, powered equipment was also often used to either launch the bridge with a conventional launching nose or simply crane the bridge into position. Particular attention was paid to the materials used. A new high strength weldable steel was developed from BS 968 steel for use in the chord and web members and other parts used standard BS 15 mild steel except for the panel pins which were made of a manganese-molybdenum steel alloy. This alone could warrant a book. One of the key requirements of the Bailey Bridge was that it could be easily manufactured by a number of manufacturers, not necessarily specialists. 650 firms were to be involved in the production of Bailey bridge components, prior to the war some of them made greenhouses, window frames, bedsteads and even canoe paddles. Littlewoods of football pools fame even made pontoons and other components for Bailey Bridges. This mass production of Bailey bridge parts is an equally incredible story. Design work started in December 1940, testing started in May 1941, production in July 1941 and was with Royal Engineer units by December 1941. Braithwaite, of Braithwaite water tank fame, was the first manufacturer, still in existence, click here for their website. The contribution of Braithwaite should not be underestimated, not only did they contribute to the design and prototype of the Bailey bridge they also freely shared their knowledge and experience with others engaged in production. Thos Storey were also instrumental in the initial stages of mass production. It was foreseen that maintaining quality and consistency would be a challenge and an absolute requirement. The UK decided to use different firms to manufacture different components rather than complete bridge sets, a sensible decision, this meant some means of consistent quality checking was needed to compensate for variations in skill and experience. Two types of jig were used, a welding jig and drilling jig, this contributed enormously to maintaining the interoperability of Bailey parts, drilling jigs for example were only used when 48 hours had elapsed from any welding to ensure shrinkage was taken into account. All panels were initially proof loaded but as production ramped up these was reduce dto 10% sample testing. A number of test centres were established that could test up to 500 panels were week, a more compact testing jig was designed and built which enabled higher sample testing. Over 70% of panels were tested and considering that 700,000 panels were made, only a couple of hundred were rejected due to material or workmanship defects. 490,000 tons of Bailey bridge were manufactured representing over 200 miles of fixed and 40 miles of floating bridge or from Christchurch to St Petersburg as John Joiner described in his book. Crucially, as the US were to learn, the fabrication and master gauges used in manufacture were crucial to interoperability. The United States Army had for some time used the Small and Large Box Girder Bridges, designated the H-10 and H-20 bridges but realised at the same time as British engineers that these were rapidly becoming obsolete with increasing tank weights, in the US case, it was not the Churchill tank but the M3 Grant and M4 Sherman. Despite a number of modifications, the Civil War era pontoon bridges in service were also increasingly inadequate. Although the US created the M1 Treadway Bridge (based on a German design) and the M2 Treadway bridge, probably the best floating assault bridge of the era, it was still not as flexible as the Bailey and for dry bridging, not relevant. Investigate modification of the British Bailey Panel Bridge to fit standard U.S. sections. In the summer of 1941 the UK sent a full set of construction drawings to the US. The project was called SP 341, Portable Steel Bridges for Heavy Loads and because of staff shortages a civilian engineering company was assigned to lead, Sverdrup and Parcel of St. Louis, Missouri. They were to modify the Bailey design to compensate for the differences in British and American steel production techniques, thread sizes and other standards but keep design changes to a minimum. The Commercial Shearing and Stamping Company of Youngstown, Ohio, provided the first test bridge. The Carnegie-Illinois Steel Company of Pittsburgh, Pennsylvania, also became involved with construction. After some trial and error, discussion and modifications the initial manufacturing problems were eliminated. Another three firms were selected for volume production, Ceco Steel Products Company of Chicago, the International Steel Company of Evansville and the Virginia Bridge Company of Roanoke. A set of gauges were borrowed from Canada as part of this process. On the 5th of December the test results confirmed the brilliance of the Bailey design and it was accepted for service despite some reservations about the manufacturing issues. The US then built and sent 25 gauges back to the UK as part of the Lend Lease Agreement and more made for us in the USA. During later tests a serious problem was discovered when the U.S. 31st Engineering Regiment found that several panels would not fit together. This discovery came late, after hundreds of American-built Bailey kits had already been sent to Europe. Some 850 of them had to be tracked down and marked as stand-alone types, not to be intermingled with any others. The first thing to say is that it was somewhat surprising to all concerned; there had been a great deal of willing cooperation between the UK and US forces, experimental establishment and manufacturers, for example, at the request of the US, a British liaison officer was posted to Fort Belvoir. After the problem was discovered it was decided to check the gauges being used against the Canadian master, it was found that many of them had been damaged and others were simply poorly made. The system of mass production and quality control applied to making the Bailey in the United States failed although it was quickly rectified. Subsequent tests conducted by the Australians on American built Baileys revealed that 75 percent of the panels were not interchangeable even with each other. After the war was over, the British returned the 25 gauge sets the Chief of Engineers sent them in 1942 because they were of such poor quality that they were practically worthless. Despite this, the US manufactured over 20 miles of Bailey bridge, a fact that should not be forgotten. Popular Mechanics featured the Bailey Bridge in October 1944, click here to read. In the previous post on floating equipment I covered the Bailey Pontoon. Because the Bailey does not have any projections below the bottom chord it was soon realised this would make it ideal for use with pontoons and design work commenced in 1941 with the final system ready by the end of the year. The final configuration used a 30ft single-single Bailey bay supported on two pontoons and either Class 40 or Class 70. These pontoons comprised three sections each, front and rear were the existing Mark V Pontoons but a new Bailey Centre Pontoon was designed and introduced to enable the greater weights to be supported. To distribute the weight evenly across all three pontoons a newly designed distributing girder. The bridge sections were connected using a new semi flexible connector that provided both a degree of movement and the necessary rigidity to spread loads across the entire structure. A key feature of the Bailey Pontoon was its landing pier; this was a single span from the bank to the bridge level and eliminated the need for unwieldy and unreliable bridge trestles that had been used in previous floating bridges. 4 pontoon assemblies were used on the landing pier as the image below shows. The image below shows a two span landing pier because of the height differential between bank and river. Previous suspension bridges had only been for personnel or very light vehicles, likes Jeeps, so the Bailey Suspension bridge was a significant step forward. A requirement developed to carry a loaded 3 Tonne GS Lorry (Class 9) over clear span distances up to 400 feet. EBE went to work, confident that Bailey parts could be used for the majority of the bridge, except of course for the cables and other suspension components. Trials took place in 1942 and 1943 and after a short period of redesign following trial failures the Bailey Suspension Bridge Number 1 was released to units in 1943. Involved in the design effort were Otto Bondy, Captain W Carey RE and Captain Ralph Freeman Junior RE, mentioned above, the designer of the Forth, Humber and Severn suspension bridges. A short time after, a revised design called the Bailey Suspension Bridge Number 2 was introduced that could carry Class 12 traffic over a clear gap of 400 feet or a single Class 18 load. Reinforcing and stiffening appropriate girders increased the load carrying capacity to Class 40. The Bailey Suspension was vital in mountainous terrain, where building piers because the roadway is so high above the river is not practical and still widely used in areas like Northern India and Pakistan. Utilising existing piers on piers built from Bailey components the multi span could theoretically bridge an unlimited length gap. In the post war period or reconstruction some incredible multi span Bailey bridges were built. Because the panels are roughly 10 feet by 5 feet, the height of the Bailey span support could be varied in multiple of 5 feet by combining panels in horizontal or vertical configuration and Christchurch Cribs or other construction techniques were used. The flexibility of the Bailey bridge design was such that a number of special purpose bridges could be constructed such as elevating or lift bridges where river navigation needed to be maintained. Although not originally intended for use with railway loads Bailey panels were used, more tightly spaced than normal and usually welded together, with a deck placed on top and the railway line son top of that. The dual carriageway Bailey bridge was used less frequently but in sites where simultaneous two way traffic was needed and the site did not permit two separate bridges a dual carriageway Bailey would be built using a common centre girder. The inner girder was double double construction and the outer girders, double single. There were a number of variations on a theme evolved from the earlier Inglis Assault Bridge. The Mobile Bailey Bridge used a free running caterpillar track assembly and was designed by Major Nayler RE and Major Longbottom RE, Major Longbottom would go on to design the Medium Girder Bridge and Major Nayler, Professor of Civil Engineering at Belfast University. It utilised a double single construction, the front span was 80 feet long and the rear span was 70 feet long. It was pushed into position by a Sherman tank or Churchill AVRE and used to great effect in Italy, particularly diring the Senio crossing. The Plymouth Bailey was a variant developed by the Canadian 1st Armoured Brigade and 8th Indian Division Engineers that used a de turreted Sherman tank supporting the bridge on a rocking roller and pushed by another. The lead tank was driven into a ramp cut into the river bank, the lead tank would then push the bridge over the gap. Again, it was used in the crossing of the River Senio, although only once. The skid Bailey Bridge was used from January 1945 and developed by the 79th Armoured Division as a means of crossing the many craters and blown culverts in roads. A length of normal Bailey bridge was constructed and fitted with skids which were bolted under each panel. Ramps were normally fitted so that the bridge could operate as soon as the pusher AVRE had backed away and in some cases, a launching nose was used. After WWII there was a large number of surplus Bailey parts disposed of, some were of course scrapped but many were put to use in any number of imaginative ways apart from bridging. Construction of the Des Joachims dam in Canada used Bailey parts to create conveyors for a gravel grading system. A factory in South Africa in the 1950’s even made use of Bailey panels as part of its roof trusses, as did the Hydro Electric Power Commission in Ontario. The Skylark rocket launch tower is another example. In 1945 and in anticipation of the introduction of the M26 Patton and A41 Centurion tanks which were wider than the standard Bailey bridge could accomodate a series of improvements to the standard Bailey bridge were needed. Three improved variants were introduced before the end of the war, the Improvised Deck Bridge, Improvised Widened Bailey Bridge and the Standard Widened Bailey Bridge. The HGB was essentially an up-scaled Bailey bridge to accommodate Class 100 loads, the anticipated FV200 tank on a transporter. It used Bailey type panels but they were larger and heavier, they could also be reinforced with chord reinforcement members. To avoid buckling, double storey construction was not used but triple storey with overhead bracing allowed a 300 foot long clear span at Class 80 tracked or Class 100 wheeled. Although construction by hand was just possible the norm was to use mechanical assistance such as the Coles bridging crane. HGB piers and a floating version were also developed in the fifties, the floating version using commercially available Storey Uniflote Pontoons. Because the FV200 tank was thought to be likely to enter service before the HGB was available the EWBB was introduced that used newly designed transoms. The patent expired in 1970 and since then a number of commercial organisations have developed the original concept, although some in India and Chinastill manufacture to the original specification where the Bailey bridge is widely used. Mabey and Johnson were awarded production rights to the Bailey bridge in 1967 and introduced a number of refinements, simplifying the design and eliminating a number of known defects. They also introduced steel decking to replace the wooden chesses used in the original and all parts were galvanised. The Mabey Universal is a heavy duty version and introduced in 1974. The LSB has a 4.2m Extra Wide single lane roadway width and can bridge clear spans in single storey construction between 9.144m (30ft) and up to 60.96m (200ft) in any multiple of 3.048m. The LSB is in service with the UK and many other nations including Spain, Slovenia and the USA and can be carried in 20ft and 40ft ISO containers, bonus! With mechanical assistance a 26 man team can build a Class 80T/110W 40m bridge in about 10 hours. That 40m bridge would use two thirds less panels, less than a quarter of the transoms and a third less weight than the original Bailey and yet have a wider deck, greater load carrying capacity and a steel deck. The video animation below shows a Mabey and Johnson Compact 200 build sequence. A floating version is available and was used extensively in Iraq, some 2,000m for US forces alone. There was also a documentary produced about Mabey and Johnson in the Philippines called Steel Bridges, part 1 below, with the rest on related links. In Afghanistan, the LSB has been used a number of times. After the war, Thos Storey (Engineers) Ltd were granted sole manufacturing licence until the expiration on the Bailey patent. The Storey Bailey Bridge made a number of minor improvements. In 1971 they introduced the Acrow Panel Bridge, this design making a number of further improvements and used hollow rectangular sections in some parts of the panel. Acrow went into receivership in 1984, Thos Storey being bought out as a going concern in a management buyout, the first MBO in the UK. In 1994 Thos Storey sold its bridging and flotation business to Mabey and Johnson and its intellectual property rights to Acrow USA, a spin off of the original, yes, it’s quite complex and funnily enough panel bridging is still listed on their website as a production capability! In 1987, Acrow USA produced the 500 Series Panel Bridge, building on the earlier design. The latest incarnation of the Acrow panel bridge is the 700XS series, introduced in response to the Mabey and Johnson Compact 200. In another application, an Acrow 700XS Panel Bridge was installed at “Ground Zero” after the World Trade Center terrorist attack to assist in the recovery effort. The bridge was a 460 feet long and was kept in place to assist in the removal of 1.8 million tons of debris. The bridge also remained in place during the rebuilding process on the 16-acre site. The Quadricon Modular Bridge System (QMBS) is similar to the Bailey Bridge system but as with the Mabey and Acrow bridges, a number of improvements. The expected life cycle for the QMBS is 75 years, Quadricon are targeting the more permanent type of installation. Janson Bridging has also modified the original Bailey structure to produce a more permanent design. The LPB system keeps to the Bailey 10 feet long panel dimension and the large HPB uses a 12 feet size, similar to the HGB. Bailey bridges are still widely used, either old stocks, straight copies or the evolved designs from Mabey and Acrow. One of their most common uses is in post natural disaster mitigation where the slower build times, in comparison with modern military equipment bridging, is less of a concern and the lost cost and ability to use local labour is attractive. The 2004 tsunami devastated many bridges and the $254m USAID funded Aceh Road and Bridge Reconstruction and Rehabilitation Project included, amongst many items, over 50 Bailey bridges as part of the reconstruction effort in the Aceh area. The original was built by Indonesian Army engineers but this was subsequently collapsed by a heavily laden truck beyond the load classification of the bridge. A temporary structure was put in place to support construction traffic only with a new single lane Bailey soon after, both were ultimately replaced with a more permanent bridge. A then and now shot of the Bailey suspension bridge on the Ledo Road built by US Army engineers, the longest Bailey suspension bridge built during the war. Perhaps one of the most symbolic Bailey bridges in the UK is the one in Rotherham, the birthplace of Sir Donald Bailey. The extremely informative video below shows the Rotherham Bailey being refurbished. Click here to see it on Google Maps and here on Geograph. During the recent floods in Rotherham the Bailey bridge was nearly destroyed, click here and here to see. When MEXE closed in 1994 some of the prototype panels went to the Royal Engineers Museum and some to Stanpit Marshes although other sources state that the bridge at Stanpit was made soon after the prototype was finished with. Yet another awesome article TD! You mention the Bailey (and variants) being used after natural disasters, etc, during the rebuild phase. Do you see a need for quicker deploying bridges, such as assault bridges, doing the initial relief phase? Gareth, I guess speed is never a bad thing but generally speaking, the faster you go the more expensive things are so by the rules of defence economics, the less you have. Thanks for the tip TD. Will check youtube now. Are the ones in the thread in your database? Did you like the article by the way? What a brilliant article! A real tour de force. I know that the modern British Army uses the LSB and still employs the MGB. However, do you thnk it is likely that they still maintain stocks of the older Bailey too for some applications? Thanks Mike, a lot of time went into this one, especially hunting down old and new photographs. I find it hard to believe such an important piece of engineering heritage like the original Bailey prototype is still actually in use as a short bridge on Stanpit marshes, its a bit sad or a bit magnificent depending on your point of view. As for old stocks, the original bailey was painted and not galvanised so maintenance and proof testing would I imagine be a problem. I know the EWBB and HGB stayed in service for quite some time, especially the HGB, but I understand most of the old stuff ended up in the Balkans or simply disposed of to the civilian market, where there is still obviously a demand. Have to say, my favourite aspect is the man who designed the Bailey suspension went on to create the longest suspension bridge in the world, after cutting his teeth on the Bailey bridge of course. Thanks for the reply. I find the whole subject quite riveting. I envy you your stamina. When’s the book coming out? The collected posts are good enough for one! Medium Girder Bridge and Air Portable Ferry bridge next, then onto the last lap with BR90 and the series is finished. I supose I should then get back into the future of series and wrap that one up. As an ex-Engineer (71 to 86) I was in 4 Sqn, 21 Engineer Regt involved on a lot MGB work including the floating MGB over the Weser in 1974, On the bailey HGB article I thought you might be interested in the ramp with deck swivel that was used in Devonport Dockyard Jan/Feb 79, which aided the decommissioning of HMS Ark Royal in 1979, the ramp was designed to move with changes in the dock water level. I have a picture of it if you want it, mail me. Allan I worked on the Ramp at Devonport Dockyard, Was bloody cold winter, but great job done by all. send me a pic please.